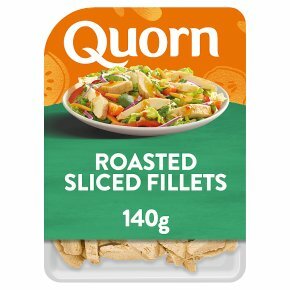 Vegetarian roast chicken flavour sliced Fillets, made with Mycoprotein? Proudly meat free. Satisfyingly simple. High in protein and fibre. Vegetarian Society approved.These Quorn Roast Sliced Fillets are satisfyingly simple and ready to eat. Quorn vegetarian roasted chicken slices are perfect for summer salads, wraps and sandwiches. Ready to eat. If you choose to cook them, simply remove all packaging. Preheat 1 tbsp of oil. Fry over a medium heat for 6 minutes, turning frequently.All appliances vary, these are guidelines only. Check product is piping hot before serving.